ict is also help the student in education. ict provides more facilitis to the teacher and learner. Ict and its offects aneducation. Ict is very useful technology.we can get alot of information through this. 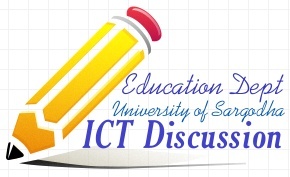 Now a days ict,s play a very important role in the development of education system. ict mean information and communication tecnology.they help us in education for learning .we use in classroom lecture .we use multimedia ,heeagprojecter etc for learning. ict is the easiest way of learning education. ict plays the role of back bone in education.we can gain many informations in our education from ict. ict plays a very important role in education.through these technologies we gain very aeffective knowladge. ICT helps us to get information about education and other fields of life. malikfurqan wrote: ict provides more facilitis to the teacher and learner. and also through ict we gain effective and very valuabel knowladge. fast of all pls tell me education???? in giving lectures it helps the teacher a lot. Teacher take help from this by using multimedia.The students also take help from it by using internet. you said very well. it also help in gaining knowledge. ict roll in education is very importent .we use ict in education we help us of our teacher through e-mail ,through forum etc.without this we use ict in education for teaching purpose.